We have a limited room block at a discounted rate with no resort fees, these are first come first served and they are only available at this rate until August 26, 2019 OR sold out. 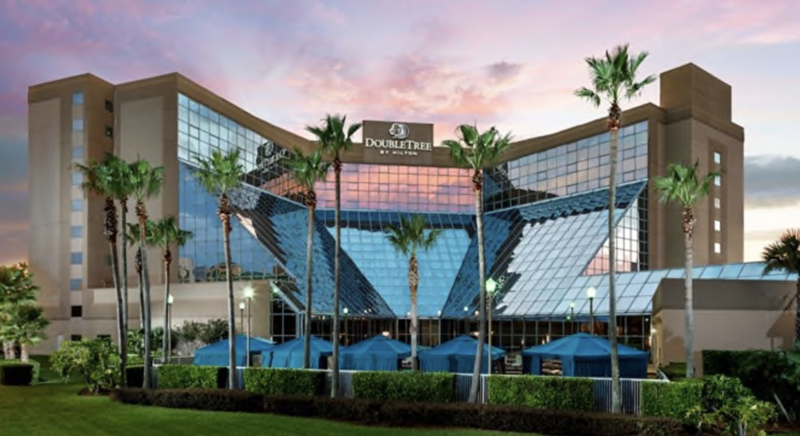 Family vacation or traveling on business, the DoubleTree by Hilton Orlando Airport is the smart choice. Perfectly located with easy access to everything. Just 1.5 miles north of the Orlando International Airport and less than 20 minutes from all the popular Orlando attractions. After a full day of fun or work, you’ll enjoy relaxing away from the bustle of the theme parks. Newly renovated, September 2018, this exciting project included extensive updates to all guest rooms, the lobby, restaurant, lounge, fitness center, conference center and event space. Enjoy the comfort and upscale amenities in our guest rooms and suites with luxurious bedding, generous work surfaces, HDTVs and WiFi. Unwind in the beautiful resort-like setting of our heated, outdoor pool. Dine at The Landings, our onsite restaurant serving the Wake-Up breakfast™ buffet, lunch and dinner. Thank you for your interest in Florida Dreamin! We can't wait to see you!